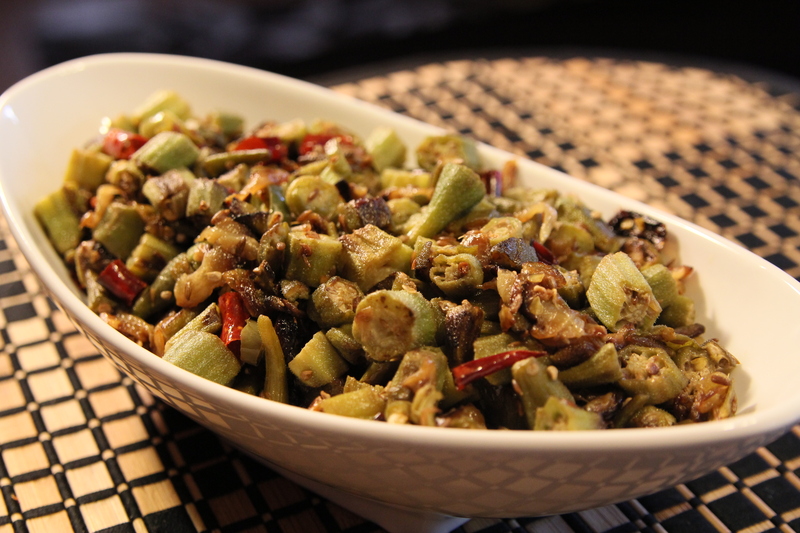 Spicy Okra is a delicious yet easy Indian recipes that’s especially great for vegetarians. This recipe goes really well with Indian bread like chapati. Chop the okra and the onion. Cut up the whole red chili and green chilies into smaller pieces. Add corn oil and chopped onion to a frying pan set on high heat 5-8 minutes until the edges turn light brown. Stir occasionally. Add the following the cumin seeds and whole red chilies. Stir. 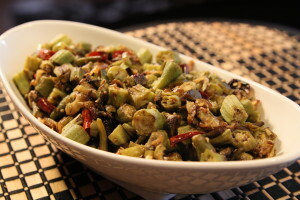 Add the following: okra, green chilies, and salt. Let it cook for 2-3 minutes to evaporate water. Cover the pan with a lid. Cook for another 8-12 minutes. Uncover the pan. Let it cook for another 5-10 minutes. You’ll notice when starting this step that the okra tends to stick to each other. Once this step is done, they won’t do that anymore and they’ll be separate for each other. Serve with an Indian bread. Squeeze lemon on top of okra if you want.